You are at the car dealer buying a new car and like a smart visitor to CarBuyingTips.com, you listened to our advice and you have researched financing in advance. Your "folder" contains your pre-approval for a loan from an online lender. 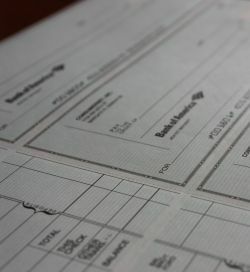 In your folder, you should have a blank check from your online lender or credit union that authorizes you to fill it out up to an approved amount to buy your car. The car dealer sees that you brought your bank draft from a credit union or online car finance site. Because this dealer is about to lose the extra gravy of selling you their own RISC (Retail Installment Sales Contract) financing, they refuse to accept your bank draft, lying to you that "online lenders bounce checks, so we don't accept them." But gee, the dealer is more than willing to provide you with new car financing at a much higher APR of course. Another excuse we have heard dealers tell you is "these online lenders take too long to pay us." In reality, these online loans are all electronic and are usually funded within a few days of the lazy dealer getting off their butts and filing the paperwork correctly with the lender to get paid. Some salespeople stop at nothing to get what they want. It's very easy to poke holes through lies like this. If your lender really was bouncing checks, we'd hear about it on the news with all sorts of federal investigations. We get emails here on CarBuyingTips.com from people who financed with LightStream and had no problems at all. I used an online lender to finance my new SUV. My friend financed 2 of his used cars with online lenders and the dealers accepted this form of payment with no issues. There's no problem taking the car dealer's financing if they can beat your best APR. If they cannot beat your pre-approved APR, then just slide that blank check over to them and use your pre-arranged financing to close this deal. Unless you can qualify for a manufacturer's super low financing, your online lender interest rates will beat the local banks used by dealers most of the time. If a dealer tries to pull this scam on you and refuses to accept your online financing then you, the customer, needs to remain control of the situation. If they refuse you, then you refuse them. Forget about buying from an unethical dealer. There are plenty of ethical car dealers out there who will eagerly accept your online financing without all the drama. If you ever find yourself driving into this dead end cul-de-sac of financing, simply tell the finance manager you're onto their scam. Remind them you are aware that online lenders such as LightStream have been in business for years and fund loans every day without bouncing checks. Force the dealer's hand on this one by making them put their money where their mouth is. Make him prove his false point. Tell him to show you online where there are complaints or federal indictments for lenders not honoring the checks. An issue this serious would surely have news stories mentioning it. If they still refuse to accept your financing, then get up and leave the dealership.